One ring to rule them all. . . The Lord of the Rings is reportedly the most expensive production ever put on in the West End, taking 12.5 million and four years to reach the London stage. 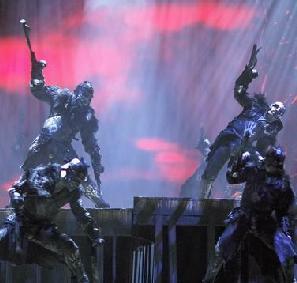 It's original March 2006 production in Toronto, Canada closed after just six months. Like many musicals which have hype and money lavished upon them, this one has been mercilessly savaged by most critics. Now reworked and substantially cut from the original four hours running-time, it l hopes to reverse its fortunes in London. It would be easy to criticise this attempt to portray over 1000 pages of a veritable odyssey of fantasy and mythic folklore into three hours of staged song and dance as irrevocably misconceived. With the trilogy condensed into one book per hour, the production is a potted summary of the epic tale in some respects. Nevertheless, it won the approval of the author's granddaughter Rachel Tolkien when she saw it in Canada. It would be an understatement to call the staging elaborate, with technology which is both costly and advanced. With an unprecedented number of pneumatic lifts (an impressive 17) and three revolving stages, a shifting texture for journeying and warfare is created. The actor playing Frodo (James Loye) even protests that he once got lost in the middle of a performance. In view of all this, the sets are, as might be expected, visually stunning. An imposing tangle of woody roots dominates the first act, stretching out into the audience and circling in the centre around a large ring-shaped hole. Throughout the course of the evening, the audience is treated to dramatic skyscapes, blizzard-beset mountain-tops, deep forests, underground caves and fiery volcanoes. Much work has gone into creating a theme park-style world, so before the show starts, a chorus of hobbits frolick around the auditorium catching fireflies. During a short interval, orcs invade the audience, prowling and snarling much to screaming schoolgirls' terror. The hobbits wear knitted tank tops, tweed trousers, hairy feet extensions and bottom padding (which diminishes as they struggle forward on their marathon journey). In fact, the hobbits and their homeliness is a refreshing antidote to the some of the pretensions (narrative and visual) of the production. Fans will not be disappointed at the range of characters faithfully put on stage: the dainty, sparkling elves, the tall and willowy wizard Gandalf (Malcolm Storry), Ents on ten-foot tall stilts and the rugged ranger Strider (J�r�me Pradon). The villains are arguably more striking, with the chilling Black Riders in ragged black skeletal puppet constructions, a giant spider which fills the whole stage and orcs with kangaroo stilts and circus skills. Gollum (Michel Therriault) makes a great entrance, crawling down the vertical roots, like a camouflaged prosimian. In spite of all this lavish visual appeal this production lacks persuasion as a musical. The songs are not particularly memorable and especially poor was Arwen (Rosalie Craig) and Aragorn's (J�r�me Pradon) love duet. Any rousing epic or enchanted elven songs simply felt mediocre. The hobbits' songs were more successful though which is perhaps a reflection of their singing/story-telling culture in Tolkien's original. Although not a truly beguiling production, this musical is magical in places so perhaps the criticism has been unfairly harsh. Peter Jackson's recent film trilogy recreated the books so well that it was always going to be difficult for a stage version to compete in any audience's imagination. Unfortunately, , the musical does not try to carve out its own individual personality and instead unmistakably mimics the cinematic version in certain scenes and character-styles. Too close a comparison is a fatal mistake, as some things such as monster make-up or colossal battle scenes can be farm more effectively portrayed in a film. The result is a play which seems to inadequately ape the film so that some of the most memorable scenes emerge as clichéd. There is spectacle and atmosphere in abundance, but not much else.